TubeNet Sponsors make TubeNet possible! Over time, I'll be offering bits and pieces that were/are related to completed projects, or to projects in which I've lost interest. This announcement is NOT any sort of invitation for private tours through blokeplace's junk pile, and nor is it an invitation for inquiries with phrases similar to "I was just wondering if you might have a..."
Yes, I probably DO have a "...", but - if it's not announced as for sale, it is NOT for sale. The FIRST grouping of items is listed in the next post, and must be purchased complete. Check back every once in a while for any possible newly-listed items. Please do NOT contact Antique Archaeology, Inc., Mr's. Mike Wolfe or Frank Fritz, nor Ms. Danielle Colby. Last edited by bloke on Thu May 17, 2018 2:28 pm, edited 5 times in total. 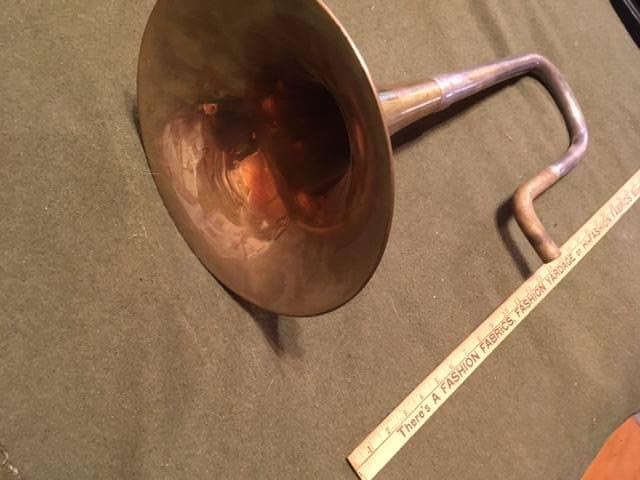 THE CIMBASSO BELL SECTION IS SOLD. THANKS ! 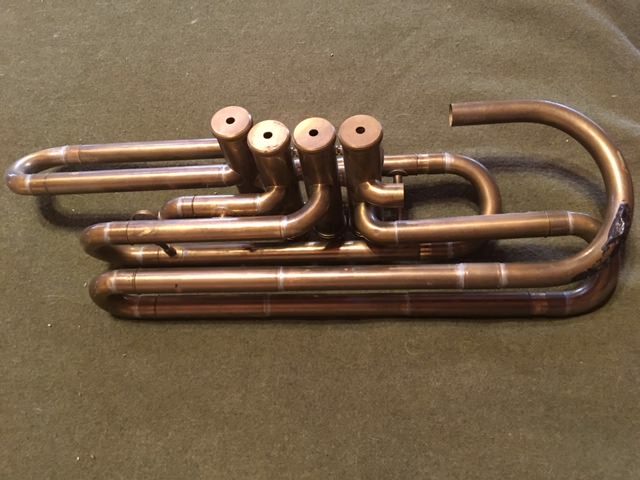 cimbasso project bell section parts (four not-soldered-together components, as seen below in pictures). The size descends from a 10-3/8" bell flair diameter to a .835" inner diameter on the small end. The physical length is approximately two feet. I will ship/mail this for $30 to the CONUS. It will be shipped free of dents. I guarantee nothing regarding "tuning", "acoustics", or any other aesthetics. The first person to respond with "I'll take it" (or something similar) will be offered the first chance to purchase. Last edited by bloke on Wed May 16, 2018 6:23 pm, edited 1 time in total. 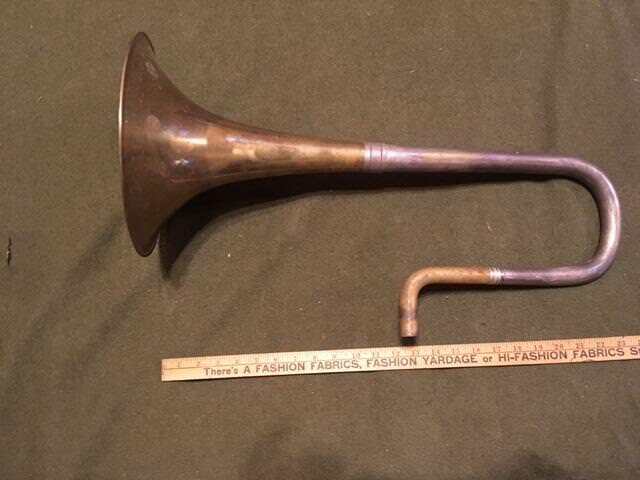 cimbasso bell section parts - spoken for pending payment. How much for the yard stick? Current 'stable'... Rudolf Meinl 5/4, Marzan (by Willson) euph, King 2341, Alphorn, and other strange stuff. Dan Schultz wrote: How much for the yard stick? I need that - for measuring TNFJ members' I.Q. 's - based on the questions they ask me. As can be seen, it goes all the way up to 36. As a true "meter" of the responses it's only 92.30769230769231 % accurate. For all you do, this " target="_blank's for you. bloke wrote: As can be seen, it goes all the way up to 36. Knowledge is knowing a tomato is a fruit. Wisdom is not putting it in a fruit salad. Willson 4-piston model 3400 Eb tuba front-action valveset with slides. 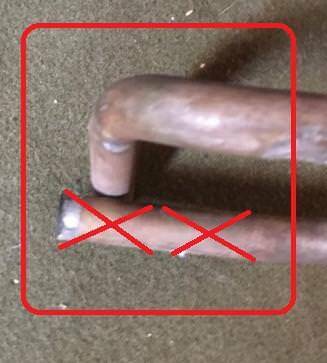 The last small right-angle piece which finishes off the lower #4 valve circuit is not here. If I find something that works, I'll toss it in, but I am not obligating myself to supplying anything additional other than what is pictured, and base your purchase on it being missing. I'm offering nothing more than what is pictured, and no enhancements - ' only offering packing for shipment. There is currently some splattered pitch (for bending branches) spilled on one of the bows (seen in some of the pictures) which I WILL clean off prior to shipping. The bore sizes are 18mm (.708") 1-2-3 and 19mm (.748") #4. The only valve circuit which is braced is #3 and it is braced to itself (upper and lower) as well as to #2. All of the valves work. 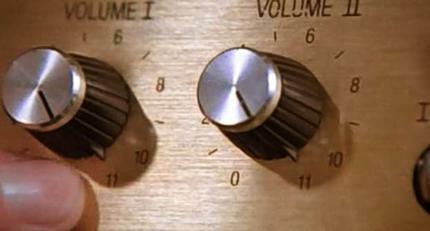 This has NEVER been installed on an instrument, and is all new. 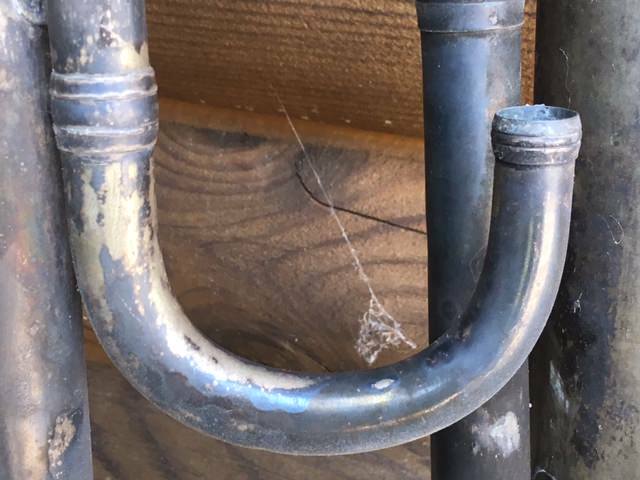 Could it be shortened to F lengths? Of course, it could...by the buyer, or by their local associate. The pistons are stainless steel. I see no nickel silver parts anywhere on this...all un-lacquered yellow brass. If the buyer desires genuine Willson braces, The Getzen Company can supply them. 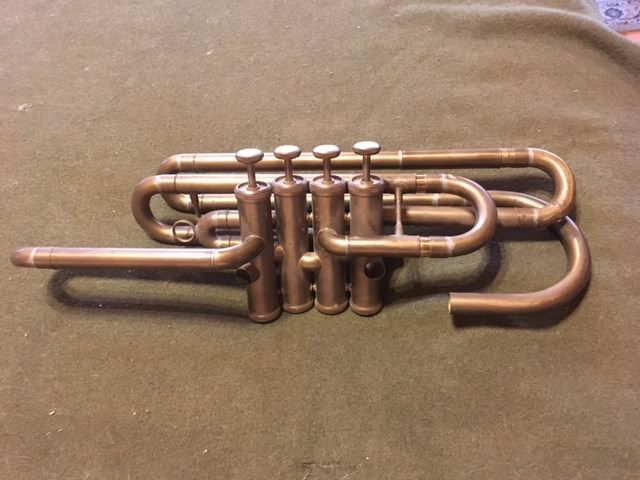 If "something that works and looks fine" will suffice, I would probably suggest that the buyer make contact with Jupiter (KHS Music) in Nashville or Conn-Selmer in Eastlake, Ohio. The little missing angled crook is .748" bore. 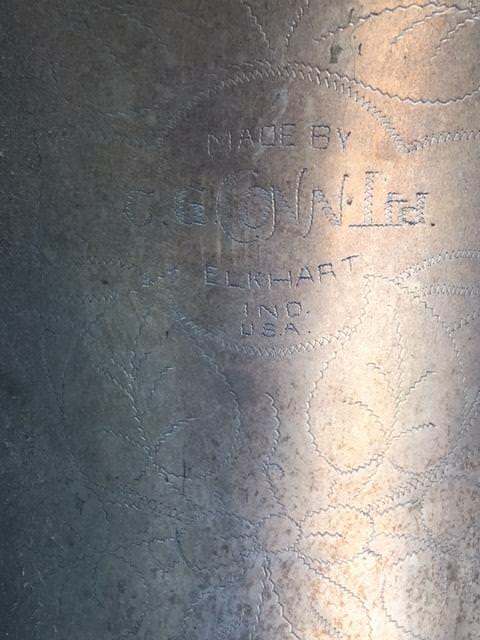 It might just be best to send a picture to Dave Surber at The Getzen Company, and get the genuine part from Switzerland. 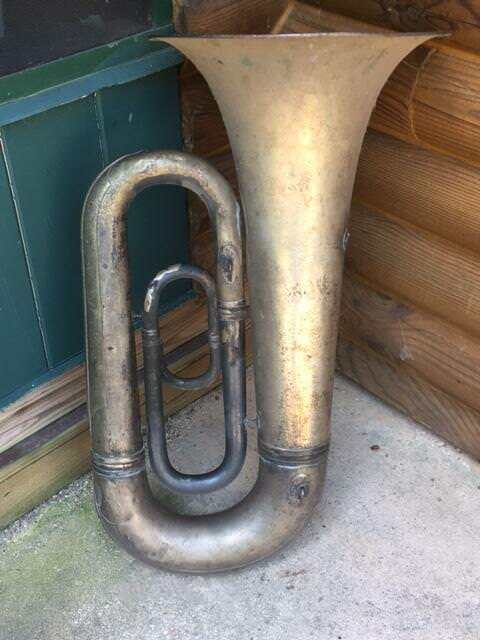 If a reasonably in-tune large vintage Eb tuba bell and bows (additional money...) would make this more interesting), let me know, and I'll put something - that I have in mind - with it. If I had $1500 sitting here it would have been mine an hour after you posted it. Eventually, most every project that I - looking hard in the mirror - realize that I'll never complete and/or have lost interest in and/or is leftover from a completed project (where - at least for part of a project, I decided to "go in another direction") will eventually be offered here. I don't want to list more than one-at-a-time, because I don't want to face a whole bunch of packing/shipping at once, and because I don't want the various "project parts" (well...) competing with each other for potential customers. I have a really nice c. 100-year-old Conn Eb tuba bell-and-bows that (in my opinion) would go really nicely with this valveset. 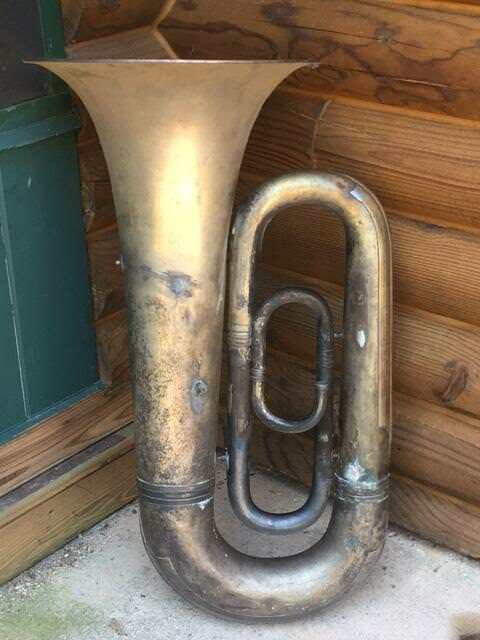 In my view, it's more 21st century looking (and potentially, playing) than the later 1930's large Conn Eb tuba bodies, and the bell diameter is more (in my view) appropriate to a large Eb tuba at 17-1/2" ...and a tall 36" overall height. Before I removed the (leaky valves) factory valveset, I noticed that the intonation was superior to that of the later large Conn Eb tubas as well. 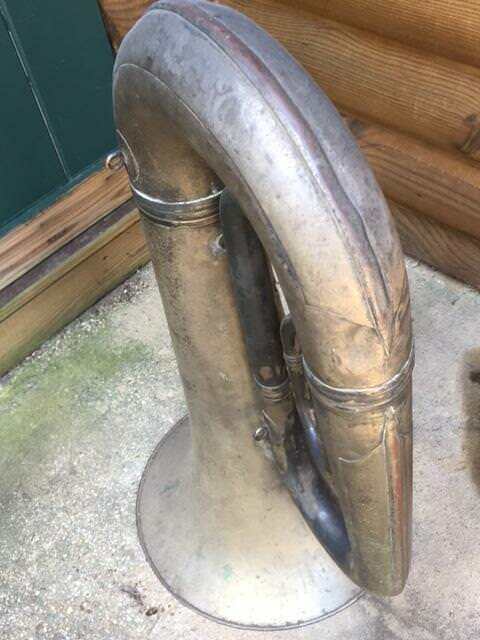 I can put the Conn tuba bell/body with the Willson valveset, include Greyhound, and offer the package for $1900. If there is SINCERE interest in this package (vs. the valveset alone), I'll post pictures with the two sort of "laid together". The Conn Eb bell/body assembly is satin silver with a gold wash interior...no patches, and minor dinks. 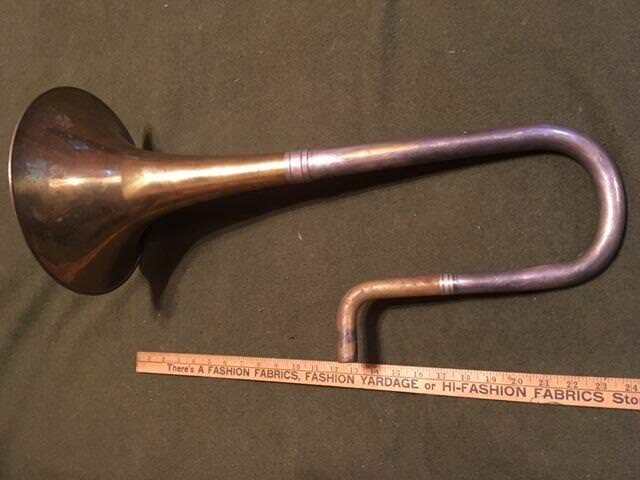 The original worn-valves three-valve valveset featured a tuning-slide-in-the-mouthpipe, so there ~IS~ room in the length of this instrument to convert that smaller lower bow to a tuning slide (via the addition of slide tubing). I have a large bore rotor assembly that will probably line up with the bore size of the LARGE side of that small bow. Hi Bloke- I'd be interested in the valve section. Will you ship abroad? Yes, I would do that. Can you send me a pm, my message keeps going into my outbox! gradyhassan wrote: Can you send me a pm, my message keeps going into my outbox! If it is in your Outbox it means the person has not yet opened it. Once it has been clicked on by him it will move to your Sent box. He is getting them, but has not yet had the time to weed through his PMs.